Used Bentley Arnage Review - 1999-2010 | What Car? 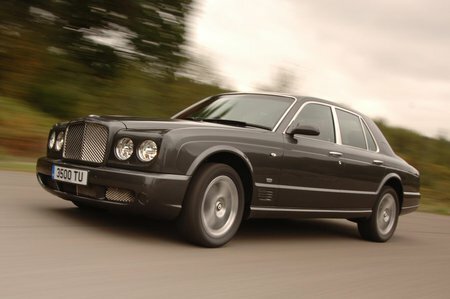 What's the used Bentley Arnage saloon like? 'Magic carpet ride' is something of an overused cliche, but in the case of the Bentley Arnage it's justified. The car wafts along in a straight line with impeccable manners, but it doesn't mind being chucked into corners, either. The steering is a bit light, but the slick automatic gearbox is a joy, and the big Bentley handles very well for its size. It's very quick, too; thanks to the 6.75-litre petrol V8, it hits 60mph in less than six seconds – impressive for a 2.5-tonne monster. Interior space front and back is okay, but not spectacular given the Arnage is nearly 5.5-metres long. The high seating position won't appeal to taller drivers, and the stunning views of the handcrafted bespoke wood and leather detailing may not quite make up for that. Equipment levels are high, though, and there's a cracking audio system, which is handy for covering up the wind and road noise that intrude into the cabin.